This is one of the best tasting dim sum around, the semi sticky / slimy, salty, sweet taste is really something to crave for, a dish with more bones than meat but people still keep on ordering. A really simple dim sum to prepare which only cooks for around 20 minutes and preparation is close to none. The ribs used in this dish is a bit different to the normal pork ribs, the part used is the one near the tips where it is more of a cartilage rather than bone. Make sure to buy only those as that’s the key ingredient, it thickens up the sauce and give that slimy texture, so if you go to an Asian Shop ask for the pork rib tips or tell then you will use it for “Pai Gwut” that’s the Chinese name for this dim sum. If you haven’t tried this yet, I highly recommend this but do use the right ingredients to get it right. In a bowl mix together black beans, wine, cornstarch, ginger, garlic, sesame oil and sugar. Add pork pieces and coat evenly with marinade. Cover and marinate in room temperature for at least one hour. Place a steaming rack on a wok, fill it with water then turn the heat to high. 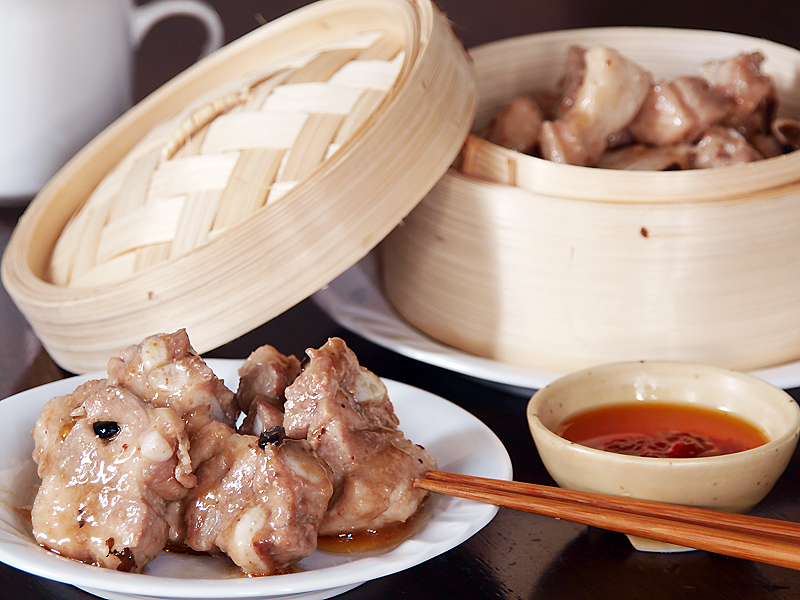 While waiting for it to boil, prepare small saucers, place pork ribs together with the sauce. Place the saucers in bamboo steamers then place it on a the steaming rack. Cook for no more than 20 minutes. i love dimsum but haven’t tried this yet in our dimsum restaurants here. I always go for siomai. Sinful as it may be, but one of fav Raymund. Eating too much of it got my cholesterol high, so its an indulgence once a while now. I am sure you must tasted these pieces inside the Bak Kut Teh. I never thought that steamed ribs could be so fantastic. yam cha yan bro ha…….tsaaalaaap!!!!!!! Hello Ang, your pork ribs look so good and the recipe seem so easy.. I will try them for sure! Thank you so much for visiting my blog, I really appreciate it! I admit, my initial reaction to steamed meat is not a good one, but your description has me really intrigued. I will try this! I just don’t think about steaming meat, once again I am intrigued by cultural differences in food. These look fantastic to me! This is one of my faves at yum cha and never thought of cooking it at home since it is soo readily available. I really should try it since the recipe is so simple and delicious. Thanks for sharing. One of my dim sum favourites!! I’ve never steamed anything over a wok- sounds delicious and flavorful! I’m thinking this is what my husband order… I usually focus on dumplings and egg tart, buns, and all that kind of stuff, not too much about chicken feet and the meat dish, so I can’t recognize. I’m sending this link to my husband to check it out. =) He’ll be happy if it is the same one. 😉 Thanks for sharing! I know that these would be a hit with everyone in our house, but especially the kids. It looks and sounds just delicious! I’ve never had this before. I’ll have to be on the lookout the next time we go out for Sunday morning dim sum.